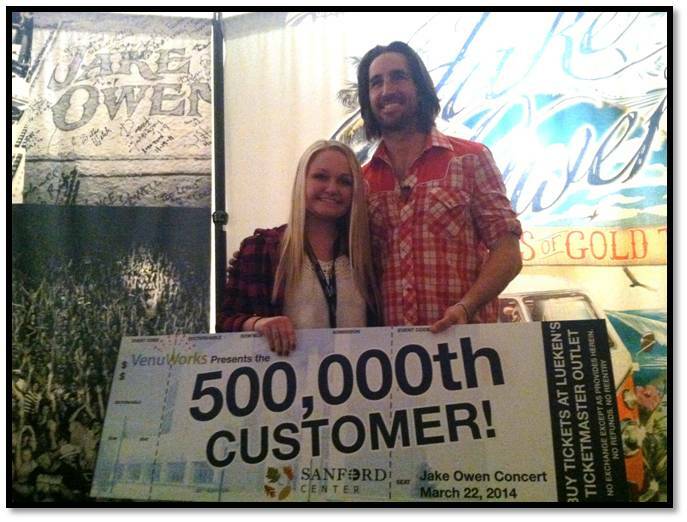 VenuWorks of Bemidji LLC, the firm that manages the Sanford Center & George W. Neilson Convention Center, surprised Payton Lund as she was the 500,000 customer to walk into the Sanford Center at Saturday’s Jake Owen concert. The facility opened its doors just three years ago in October of 2010 and now has entertained over 500,000 people. According to Executive Director Curtis Webb, “It was an ideal night with flashing lights, confetti canons, and excitement as we recognized the 500,000 customer.” Webb went on to say Payton was awarded a large Sanford Center commemorative ticket, a customized Sanford Center chair, 2 free tickets to a future event at the Sanford Center, concessions to enjoy for the night (provided by VenuWorks), and a $100.00 gift certificate, courtesy of Tutto Bene. Webb also stated that the economic impact for Bemidji has been calculated to exceed 54 million dollars over the first three years. The Sanford Center continues to play a vital role in increasing the quality of life and upholding its mission statement. The Sanford Center & George W. Neilson Convention Center are managed by VenuWorks of Bemidji, LLC.